Windows Explorer is optimized for single-folder operations. Here you can sort the files by file extension, name or date for instance. It becomes problematic if you want to do that for a folder and all of its subfolders. While you might be able to use the search for a workaround that works so-so, it is usually not a comfortable thing to do. And other options are not available in the Windows file manager. 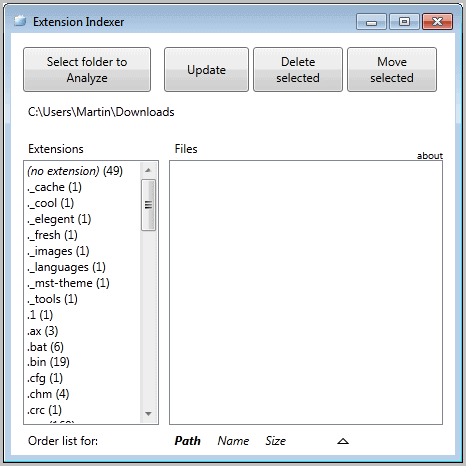 Extension Indexer is a free program for the Windows operating system that steps in and offers a working solution. The program adds missing functionality to work with files in a complex folder structure under Windows. The software scans a selected root folder, the root folder's sub-folders and all files contained within, and displays them listed by their extension in the program window. All file extensions and their count are displayed in the left sidebar. The matching files are displayed once you click on a extension in the left sidebar. Each file is listed with its relative path, file name, extension and size. The program furthermore displays the total size of all files in the interface. A double-click on a file opens it in the default file viewer. Sorting options are listed in the program footer. The available sorting options are by path, name or size which can be displayed in ascending or descending order. Buttons at the top are available to delete or move selected files. Deleting selected files display them in a confirmation window again with options to proceed or cancel the operation. A folder browser is displayed if the move selected option is activated instead. The remaining button updates all the files and folder listings in the program window. Extension Indexer is a handy program. It could benefit from interface improvements, for instance a folder browser displayed directly in the program window to make moving files more comfortably. Windows users who would like to try the portable program can download it from the project website over at Sourceforge. The program is compatible with 32-bit and 64-bit editions of the Windows operating system. the old X-Tree DOS file explorer used to have a function that would show ALL files form ALL folders on a drive in a single window (and then you could sort by name, extension, date, etc.). I’d like to see someone build this into Windows Explorer. There is also this old piece of freeware that I have used for a long time to add an extension column to Windows Explorer (I hide the stupid TYPE column). This works with WinXP. Unsure if it works with Win7 or not. win 7 dont do it by default? Odio, while you can sort files in one folder, you cannot sort files that are located in a number of subfolders.